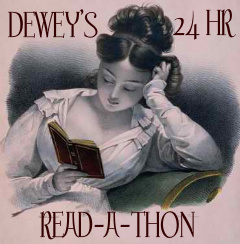 The 24-hour read-a-thon begins now! I’ll be posting updates here throughout the day, so I apologize in advance for the eventual length of this post. Which book in your stack are you most looking forward to? Probably Maggie Stiefvater’s The Raven Boys, since I loved The Scorpio Races so much! Which snack are you most looking forward to? I actually didn’t buy snacks in advance…oops. I’ll definitely be hitting the grocery store today though! Tell us a little something about yourself! I have bobbleheads of three (current or former) Supreme Court justices. If you participated in the last read-a-thon, what’s one thing you’ll do different today? If this is your first read-a-thon, what are you most looking forward to? I’ve done the read-a-thon a few times in the past, and my focus has usually been solely on how much I can read. This time I’m going to take it a little easier, go to bed at a normal hour, and spend more time visiting people’s blogs. Hour 4 — Not too much to update, sadly! I had to run some errands this morning, so I haven’t actually done much reading yet. I’m 67 pages into The Assassin’s Curse and liking it so far. Hour 6 — Still not done with my first book yet, which does not bode well for my progress in this read-a-thon. On the other hand, I’ve been having fun doing some mini-challenges and visiting the other readers’ blogs. Hour 7 — Finally finished The Assassin’s Curse! I quite liked it overall, although I hate books with cliffhanger endings, especially when there’s no previous indication that the book is part of a series. Oh well — on to The Westing Game by Ellen Raskin, which I somehow never read as a child. I will post the answer in my wrap-up post tomorrow! Feel free to guess in the comments…winner gets bragging rights. Hour 11 — I finished The Westing Game, which turned out to be pretty great! It was a lot deeper and more thought-provoking than I thought it would be. On to my next book, My One and Only by Kristan Higgins…and time for dinner, too! Hour 13 — Time for the mid-event survey! How are you doing? Sleepy? Are your eyes tired? I’m actually fine for the time being, but ask again in 3 hours. What have you finished reading? A whopping two books thus far, The Assassin’s Curse (Cassandra Rose Clarke) and The Westing Game (Ellen Raskin). What is your favorite read so far? I guess The Westing Game, but I’m also quite enjoying my current read, My One and Only. Have you found any new blogs through the readathon? If so, give them some love! I’ve been visiting several blogs, but I haven’t been keeping too much track because of all the read-a-thon goodness going on! Tomorrow I’ll sift through it all, and then I’m sure I’ll be following some new bookish blogs. Hour 16 — I think this is my last hour, you guys. I’m starting to fade here. I did finish My One and Only, and now I’m starting Maggie Stiefvater’s The Raven Boys. One part of me is really excited, because I loved The Scorpio Races so much; but the other part of me is nervous, because how could anything else live up to it? Time will tell, I guess! I decided, too, to take it a bit easier this time. Bobbleheads of Supreme Court Justices? Only in DC! That’s great! Good luck with your reading! Your read-a-thon seems to be going well. I’ve read Stiefvater’s Shiver series but not her more recent books. Sounds like The Scorpio Races is worth checking out. So far The Scorpio Races is the only Stiefvater book I’ve read. I’m actually a little nervous to read anything else by her, for fear that none of her other books will live up to it! You look like you’re going strong! Good job! I’m not sure whether I’m going to try to stay up late or not. I don’t really like missing sleep. It makes me grumpy :p Besides, my eyes go all wiggly in the middle of the night. Me too, definitely. I figure I’ll just read until I get tired and then call it a night. Hey, I think I got the Book Puzzle – Cold Comfort Farm? Thanks very much for joining my challenge and good luck with the rest of the ‘thon! Yes, that’s right! 🙂 Happy reading to you! “Freezing … pillow … farm … ?” Yeah… I’m not good at puzzles. I love The Westing Game, I’m glad you enjoyed it! Don’t worry about not ploughing through book after book; sometimes I get discouraged by that when my reading goes slowly, but the important part is reading books we enjoy and having fun, whatever the final ~count~ ends up as. So I hope you enjoy My One and Only! Keep trucking, you’re doing great! Haha, sorry, your guess is incorrect (I’m sure you’re shocked). I’m not too discouraged by my progress thus far — or lack thereof. This time I’m just in it to have some fun. I really liked The Westing Game, though! I’d heard it was good, but I was still very pleasantly surprised.